Sure Batman likes to be just one of the people, but that doesn't mean he has to drive sitting at their level. 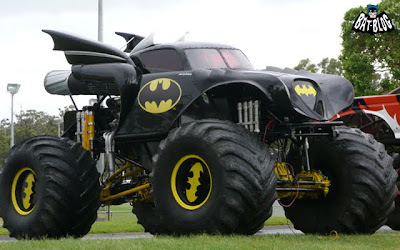 If Gotham is like any other city, he needs something that can crush traffic jams and the odd wayward parking attendant beneath its wheels, just as much as it strikes fear into the heart of evil doers. Ladies and gents, the latest addition to Bat-cool, the Bat Monster Truck! See that jet engine at the back, that's for roasting Joker's on baby. Once Robin has finished his learners plates, he'll probably get a set of keys too. To the car polish cupboard lock at least. There is probably a VW crunched in amongst the gears somewhere Random... It's two for the price of one!